"All-Out War" is good for morale? The start of The Walking Dead Season 7 marked a brutal low point for our favorite group of zombie apocalypse survivors, but Season 8 promises an “all-out war” that will give Rick his swagger back and show everyone being a total badass. Plus: when The Walking Dead hits its 100th episode with the Season 8 premiere, so expect some crazy stuff to go down. And, weirdly enough, nobody’s talking about any zombies? Early responses to the upcoming episode seem positive as critics bristling with excitement for the mega-popular show’s return to form. 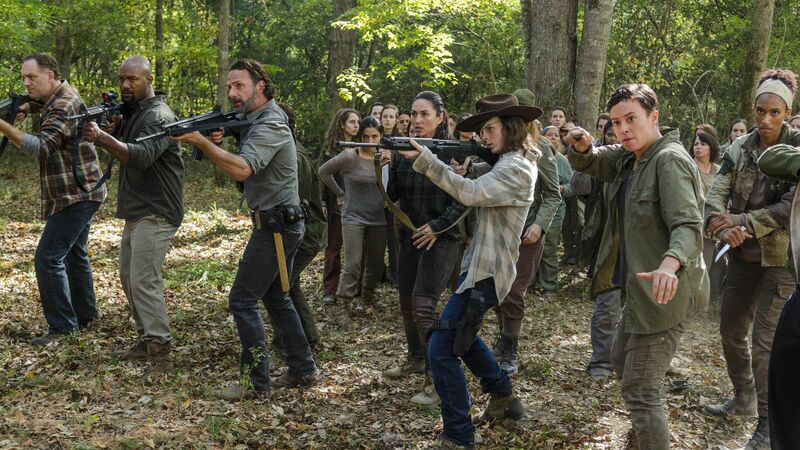 If there’s one thing that critics are all agreeing on, it’s that the new season feels like the old Walking Dead that everyone loved, and less like the slow-moving, emotionally-taxing episodes of recent memory. Season 7 saw a sharp decline in ratings for The Walking Dead, but this new season hopes to deliver more action at a larger scale that might just keep fans happy. We’ve long known that Season 8 would loosely follow the “All Out War” storyline from the comics, and we’re finally getting to see what that looks like in a zombie apocalypse. So what can we expect from this Sunday’s Season 8 premiere? Best of all, the progression serves as a natural remedy to the Season 7 malaise: “For those repulsed and deflated by the horrific deaths and methodical storytelling of last season, “Mercy” is the perfect remedy — its brisk pacing, big action, and focus on the camaraderie between the Alexandria, Hilltop, and Kingdom survivors makes for super entertaining television which makes you feel good without trivializing the drama. Our favorite pair unites for the war. The Walking Dead is often at its least interesting when it focuses too much for too long on individual characters and stories rather than its more action-packed team-ups. Rick Grimes is back in top form. Remember that the Season 8 premiere also serves as the series’ 100th episode overall, which means that above everything, it should be a tribute to fans and what they want to see. As such, it looks like fans of The Walking Dead will get some all-out warfare in which their favorite characters get to be badasses again. The Walking Dead Season 8 premieres Sunday, October 22 at 9 p.m. Eastern on AMC.